Hanoi is definitely a city that took me a little time to get my head around. On first glance, it seemed like any other big, crowded city, with higgledy-piggledy buildings and millions of motorbikes racing through its streets, not unlike the other stops I've been to in Vietnam. But on closer inspection, the French influence on the city becomes apparent, with decorative building designs, tree-lined boulevards, and the abundance of coffee shops, fashion boutiques, and artsy outlets that are quintessential to French culture, and have now informed the culture of Hanoi too. And of course, Hanoi is a hub for anyone wanting to visit sights in the same region, such as the mountain town of Sapa, or the famous and beautiful Halong Bay. Our arrival in Hanoi was an early one, after getting a 13 hour train up from Hue, but luckily we had access to shared rooms in the hotel, so no less than five of the girls piled into the two beds for a nap, while I sort of dozed in a chair, being unable to sleep properly. Although rather than go for breakfast, I opted to continue doing this for as long as possible. Anyway, the first adventure of the day was a walking tour of the Old Quarter. Initially I didn't like this area very much, as it was all narrow streets with hundreds of stalls and street vendors, and it was noisy and crowded, and exhausting to be honest. However, once I began to get accustomed to it again (you'd think I would be already, having lived in Mongkok for a year, but that actually probably puts me off these sorts of places even faster), I was able to notice the details and charms of the region, from the strings of lights overhead, to the pretty detailing on the old buildings. We saw the local markets and our tour leader bought fruits from the street vendors for us to try, including dragonfruit, which we already tried in the Mekong Delta, but in Hanoi they typically sell the sweeter pink fruit, rather than the white. The quarter can be a little disorientating too, but she also explained that each street is named after what was originally sold there, be it sugar or meat or festival decorations or whatever, another thing that reminded me of France, as I encountered places there which had a similar layout, such as the Montmartre district of Paris. Our walk finished down by the Hoan Kiem lake, which, according to legend, was where the Golden Turtle God asked for its magic sword back from Emperor Le Loi, who had been given it previously by the Dragon King god, and which he used to fight off the Chinese. The lake was then renamed Hoan Kiem, meaning "Restored Sword", and the Turtle Tower was also built in commemoration, which is easy to see from the banks. We stopped by the red Huc Bridge, but didn't pay to cross over to the Jade Island to see the temple (honestly, while they are beautifully constructed, I've seen more than enough pagodas now). From then, we had a free day, and our first stop was the Vietnamese Women's Museum, on the recommendation of our tour leader. It's probably not somewhere I'd have though to go myself, as I typically go to see other sights before visiting museums, but I was very glad we went. First of all, there aren't always that many museums dedicated to women, and furthermore, it proved how remarkable women can be. The first floor, all about marriage and childbirth was fascinating, as some of the customs in Vietnam are so different to what we know in the Western world. I can't say I agreed with all of them, but it was interesting. The special exhibit about the worship of the Mother Goddess was also good, as there is so much colour and beauty involved in this worship, and the whole concept of a mother goddess appealed to me quite a lot. The second floor was a real highlight though, as it explored women in history, in particular during the war, and there were some outstanding individuals highlighting, who were instrumental during the conflict. I had no idea there were so many female guerilla fighters and rebels playing such active roles, and there was also a part dedicated to the women who lost children to the war. After that, I checked off several other major sights around Hanoi, as while some of the group have extra days in the city at the end of the trip, I did not, so I wanted to get around as much as possible. My route took me through part of the French Quarter, just south of the lake, and I got to see tree-lined boulevards and dozens of cinema, art galleries, boutiques and coffee shops, all good reminders of why this region is so named. I passed by the opera house, which is hardly the Opera Garnier, but is still a lovely building. Both this, and St Joseph's Cathedral, which was the next place I passed, look like they've been lifted straight out of Europe, with the cathedral's massive, imposing, Gothic styled facade. The Temple of Literature was my next destination, and as a literature student I felt I had to visit this one! In some ways, yes, it was similar to many other temples and pagodas I've seen, but I liked walking through the various courtyards, with gates separating each one, and the many topiary bushes and red lanterns inside, and the pond in the centre. The temple is nearly a thousand years old, and is dedicated to Confucius and his scholars (making a change from the numerous Buddhist temples throughout Vietnam), and was even the site of Vietnam's first university (but isn't used as one any longer), making it a very important academic location. I then walked by the various buildings in the Ho Chi Minh Complex, though I couldn't enter the mausoleum, as it only opens in the mornings, but since I wouldn't have the chance to go inside during the rest of my time in Hanoi, I figured I may as well see the building from the outside. 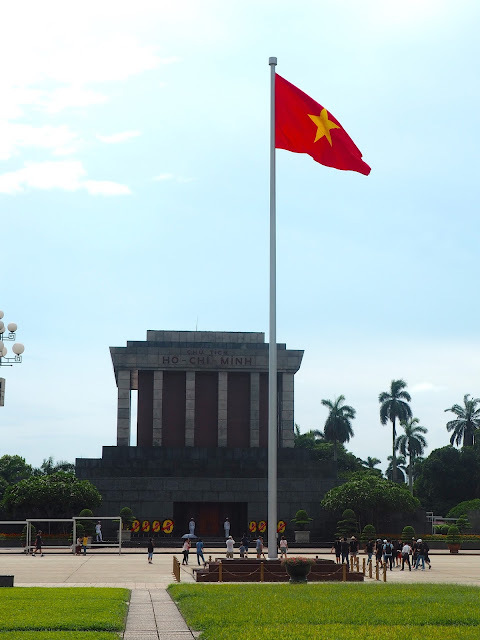 It's quite an imposing structure actually, with its classically styled pillars, and because it stands alone in front of a massive lawn, with only the Vietnamese flag in front of it. Nearby is the Presidential Palace, Ho Chi Minh's Residence, the museum dedicated to him, and the One Pillar Pagoda. You could likely spend most of a day visiting all of these sights, but as I was short of time in Hanoi, I was content to see them all from the outside, and I'm sure the mausoleum is the highlight anyway. 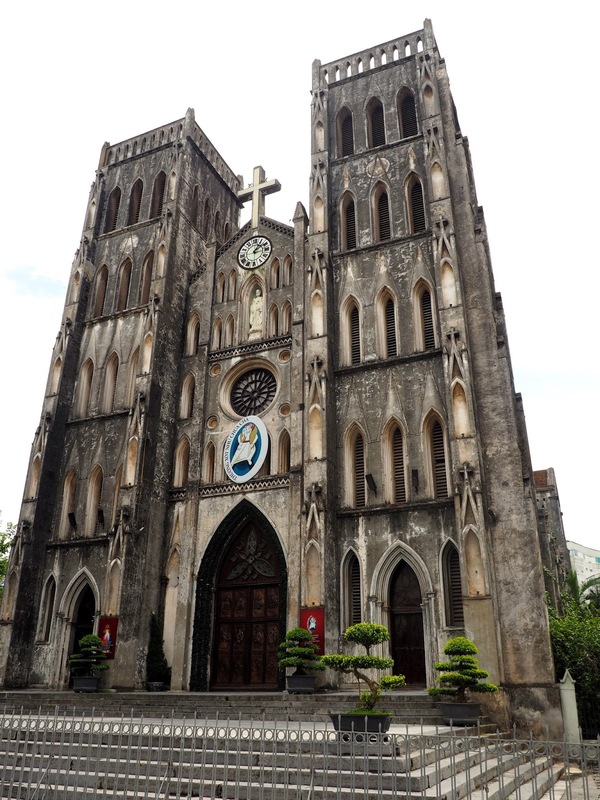 I then took a walk up to see the Cua Bac Church, which was very interesting, as its architecture is completely different to St Joseph's, especially since it's bright yellow in colour. I skipped the Citadel, since I didn't think it would compare to Hue's Imperial City, and headed back to the hotel. Although I whizzed around a lot of places, and therefore didn't get to see a lot of them in depth, but considering this was my only full day in Hanoi, I was quite happy about how much I did manage to squeeze in. If I ever make it back I'll venture inside more of these sights! That evening we took part in a street food tour, where a local guide took us around various street vendors in the Old Quarter. These tours are recommended, as you get some delicious food, without having to worry if each vendor's hygiene is up to scratch, since it's already been checked out. We had banh mi first, something I did not have enough of while in Vietnam to be honest, then a local rice pancake dish. Our walk around the area was quite long, but part of it took as along the railway line, which is still active, and has houses built right along the edge of it - I can only imagine how noisy living there must be! The main meal in our tour was a barbecue place, followed by dessert (probably my favourite course), which was a sort of fruit salad, served with condensed milk and ice. Finally we went to a cafe which you had to pass through a shop to get to, and climb up three floors to a rooftop view overlooking the lake - absolutely beautiful! And rather than the traditional Vietnamese coffee we'd been drinking for two weeks now, we tried egg coffee, which is much tastier than it sounds. The next morning we awoke early and drove four hours out of Hanoi, to reach Halong Bay. Out of the whole trip, this was the place I was most excited to visit, and it did not disappoint. We had a private boat for the afternoon, and firstly we were served lunch on board, which included plenty of seafood and the spring rolls I'm so fond of now. The best part of the boat was the rooftop, which was the perfect place for lying in the sun and soaking in the breathtaking views around us. Halong Bay is made up of thousands of small islands, and cruising through them is simply stunning. We all took so many photos, as every new view and angle was just as, if not more, beautiful than the last. Some of the group hadn't realised just how big the bay is (I already knew it was huge! ), which I assume made it even more impressive to them. It's one of those places though, where no matter how many photos you've seen, nothing quite compares to seeing it in person, and realising just how staggering and humbling nature can be. We stopped off at a cave on one of the islands, which we were told can be translated to "Surprise Cave", as the outside gives you no indication of how big it is inside. The natural rock formations are beautiful, with all sorts of stalagmites and stalactites creating shapes inside, and it now has plenty of lights inside for the tourists, which create rainbows all over the cave. After that stop, we dropped off some of the group to go kayaking, and they had a guide who led them through more caves. The rest of us stayed on the boat and got dropped off at Ti Top Island, which has a swimming area and an artificial beach (you aren't allowed to just swim off the boat anywhere in the bay). I was desperate to get in the water, partly because it was so hot, and party because I basically always go swimming when I'm on a boat, and while it was refreshing, the beach is very crowded, and the water wasn't very clean. Still, for an hour or so, it was nice to get in the water. The boat ride back to shore lasted a while too, which was nice, as I wanted to enjoy those views for as a long as possible. And we even got to see the sunset from the boat, which just made it even more incredible. It's definitely a place I will never forget, and was the highlight of the whole trip. While history and culture and architecture are great, many of my favourite places and sights around the world have been natural wonders, and it's just staggering to see these beautiful, naturally formed sights, that existed long before humans started screwing up the planet, and which I hope we continue to preserve. That night we stayed in Halong City, before driving back to Hanoi the next morning. We had dinner in a local restaurant (and while Vietnamese food is delicious as whole, I think we all are ready for our own food again after a couple of weeks), and then decided to do a little more partying before bed. Specifically, some of us went to a karaoke place near the hotel. It was one of those ones where you get a whole room to yourself, with the machine set up, and can order food and drinks into the room. The machine had both Vietnamese and English songs (so we stuck to the latter obviously), but there were a few mistakes in the English lyrics I believe, but it didn't matter. I never sing karaoke myself, no matter how drunk I get, since my singing is awful, but it's still a lot of fun and very entertaining to watch others do it, and boy did they enjoy themselves. There wasn't just singing, there was full-blown stage performances happening in that room. Freya especially enjoyed it, as she is a good singer, but had never done karaoke before, so she had a blast. We didn't stay too late though, eventually calling it a night after a long, but thoroughly enjoyable day. After driving back to Hanoi the next day, we had a few more hours spare that afternoon. Since I had covered so much of the city on the first day here, I used the time for some more relaxing pursuits. I took a wander back through the Old Quarter, and around the lake, discovering a better view of the Turtle Tower from the other side. On the south bank of the lake, I visited S'Patisserie, which my friend had recommended to me, where I had a rather delicious cake and coffee, before taking a leisurely stroll back to the hotel again. It was nice to do something simple and relaxing on my last day, after such a busy couple of weeks, and just roaming around can be a very good way of experiencing and understanding a new city. We had one last dose of local culture that evening too, when we went to watch a water puppet show. This is something entirely unique to Vietnam, and I wasn't entirely sure what it was at first, or rather, how the puppets worked. It was fascinating to see though, as the puppets do emerge out of the water, and dance across it or play in it, while the puppeteers are hidden behind a screen in the water. The show didn't have a plot, but rather depicted various scenes, of local life, such as farming and fishing, or of legends, such as Le Loi returning the sword to the turtle god, and a group of fairies dancing, all accompanied by a group of musicians performing live a the sides of the stage. What dialogue there was, was in Vietnamese, but since it wasn't exactly a story, we could still understand what was happening, and more than anything else it was fascinating to watch the puppets at work, since it clearly takes a lot of practice and careful choreography to execute the show. Afterwards, we had our farewell dinner, which the whole group attended, and while the service in the restaurant was frustratingly show, we salvaged the evening by taking our tour leader down to the lake to say our goodbyes, rather than doing it at the meal. It's a lovely location, especially at night, and after handing over our parting gift, and having our hugs and last group photo, we spent a little longer down there having a drink together, before it was time to turn in for the night. I left early the next morning, to fly back to Hong Kong for a few days, so that evening was really my last bit of time in Vietnam. All in all, it was a wonderful trip, and I can only say thank you again to our tour leader, Tham, for helping us to explore her country. I feel like I learned a lot about Vietnam's history and culture, which I didn't know much about at all before leaving for this trip, and in particular, it's wonderful to see how happy and optimistic the people there are, considering their tumultuous and war-torn past. Delicious food, beautiful natural scenery, rich culture, and fascinating, friendly locals; what more could you want when exploring a new country? Thank you Vietnam, it was wonderful.